Turri is a historical company which was founded in 1925 in Carugo, province of Como, and is currently located in Brianza. It is headed by Andrea Turri, who from the beginning has chosen to produce what is often defined as “classical”, “art”, or “high style” furniture and accessories. Its motto is “The Art of Living”. Turri's products require, before and after painting, such special treatments as gold-leaf application, pictorial decoration, and overall enrichment with parts made with leather, marble and other materials – all strictly made by hand and where each element is custom-made to meet customers’ requests by specialists who are true and proper artists. Upon request, the pieces are also hand-painted. This kind of work has always characterised Italian products, built their reputation and made them stand out and appreciated, especially by the large foreign markets (first and foremost Russia), which constitute the customer basin for the entire Turri production. The decoration department is “locked and sealed”, and rightly so. The people who work there put into practice day in and day out decades-long exclusive experiences, a heritage of creativity, refined taste and craftsmanship that is jealously guarded. You can get a glimpse of the results of this “quiet” work by viewing our photos of the finished furnishings. It is the decoration work – accompanied during the production process by close attention to detail, a quest for perfection and an unforgiving quality control, during and after painting – that sets the Brianza-based company apart as a perfect example of innovative entrepreneurship, which at the same time continues to base a large part of its success on artisan craftsmanship. The VDL - Verniciatura del Legno (or Wood Painting Magazine) journalists were invited to visit the furniture factory by Dario Tropeano and Gloria Valtorta of Elmag Superfici of Monza – the world-renowned specialised painting plant with an ever increasing number of automated lines, known for its great production flexibility – which has played a decisive role in launching the new Turri, as Matteo Beacco, the production manager, himself has noted when he welcomed us and took us on a guided tour with professional courtesy and skill. The current production plant was inaugurated in September 2013, after moving the company headquarters from its historical location in Carugo to Capriano, in the province of Monza and Brianza. 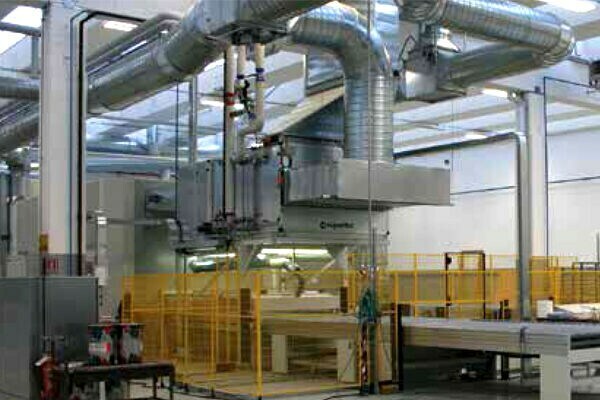 The installation of production systems was completed in a very short time, which allowed production to continue without any serious interruption: The record operation, which included moving, installing the production lines and organising the service departments, was completed in a single month. At the old Carugo headquarters, which will be moved to the new plant in a year’s time, we visited the showroom, opened for us thanks to the generosity of Andrea Turri. “The move to the new production plant (roof-covered 10,000 square metre area where 80 employees work),” said Matteo Beacco, “coincided with the most significant part of a larger change, as we introduced great innovations in the painting cycle, both in terms of systems and of paint products. 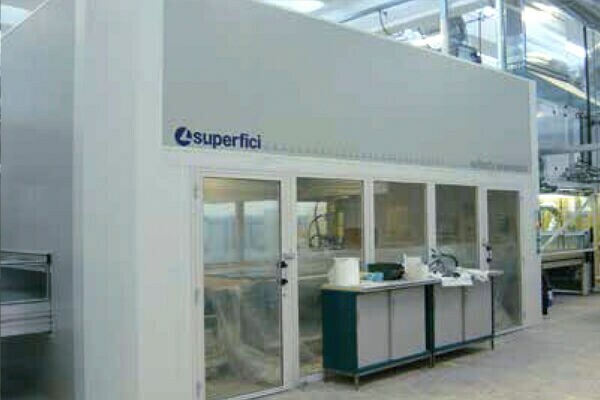 “Indeed we switched from using polyurethane spraying booths (spraying material that is still in partial use today) to a very large booth with an automated spraying robot which can accommodate workpieces of up to 3,100 x 1,600 mm and up to 100 mm thick), and to using UV finishes, solving this way the problems of the uniformity of finishing quality as well as of applied paint quantity, now considerably lower than in the past (by half), besides the obvious problem of drying times (UV drying times are much shorter): The result is that cycle times are now considerably shorter and productivity is higher.” “The plant and systems are innovative,” Mr Beacco goes on. “The only thing still in use from the traditional concept is the vertical oven, for paint settling prior to the final drying with mercury-vapour UV lamps (the type suitable for curing glossy transparent finishes). The decorated panels enter the painting booth to be coated with an opaque transparent insulating polyester layer to protect the decoration. The polyester-coated panel edges are then sanded both manually and mechanically (all flat surfaces are sanded mechanically, too) using a numerically controlled edgebanders. 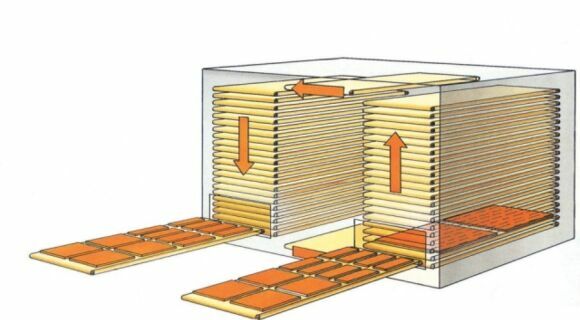 Upon exiting the booth, the panels enter the vertical oven (containing 38 trays) and dried with hot-air dryers at differential air temperatures (starting with 37°C and ending with 45°C). A conveyor belt takes the panels to a cross-conveyor which repositions them in preparation for the second painting booth (following a brief pause in a control area for verifying the quality of the polyurethane coat). The panels then re-enter the painting booth for the UV finish (lacquered or transparent). 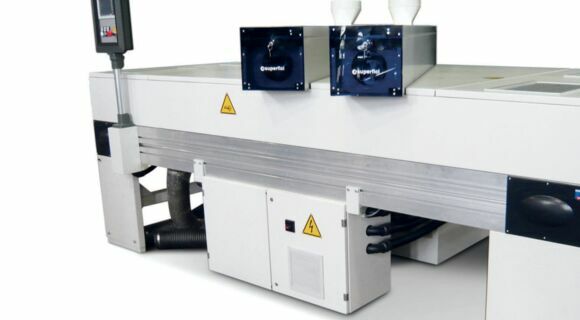 Upon exiting the vertical oven, the panels enter the UV station and then delivered ready to be brushed until they attain a mirror-like polish, as required by the market. 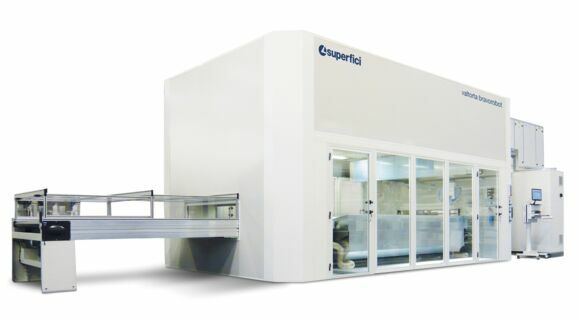 The new Superfici line may include a dual manual painting booth, required when special three-dimensional parts are produced. It has often been said that innovation is the main resource for combating the economic crisis. Yet we also know that in order to innovate you must invest, a difficult step to take at a time when access to credit is a thing of the distant past. Turri teaches us one thing that all business activities must reflect, for better or worse, concrete marketing policies – that is, concrete, regardless of what gets printed on business cards, and more specifically creating a market or entering new markets. Turri has created its market a long time ago, and has now introduced into this market the elements of innovation, which have invigorated the market and helped it thrive. If we then add the other intelligent company resource, the never neglected artisan craftsmanship, we can clearly conclude that the company we visited “colours” (and not only with its decorations) the dark rampant pessimism.